Aaah, 1986. Aside from all the great music that came out that year, it was a landmark 12 months for me as I completed primary school. The end of Year 6 was marked by the obligatory school disco, however all I can recall from the occasion is the horrible yellow shirt I wore. I have a much better memory for the issues of Smash Hits I bought that year or the episodes of Countdown I managed to watch. In fact, years later when I worked at Smash Hits and looked back over magazines from when I was a reader, there were certain issues I could remember every page of. Likewise, when Rage replays old episodes of Countdown every January, there are some from the 1986/87 era that I am sure I watched at the time. I guess there are worse things to have a photographic memory of. 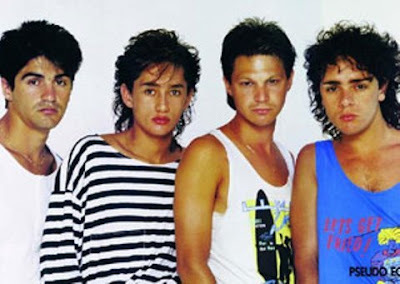 With their debut - and best - single, at number 30 is "Stimulation" by Wa Wa Nee, the Australian synthpop group who would find brief fame in the US in 1987 with "Sugar Free". "Stimulation" was bigger than most number 1 hits that year, taking up residency in the top 5 during winter and ending up as the fifth highest selling single for 1986. I was a fan of all Wa Wa Nee's singles (yep, even the ones from their less successful second album) and recall them being a staple in Smash Hits magazine around the time. Last year, I even saw singer Paul Gray perform every one of his group's hits when he supported Belinda Carlisle in concert - and I can report that he's aged incredibly well! On a more sombre note - at number 29 it's "A Question Of Lust" by Depeche Mode, which was the band's least successful release in the UK since their debut single, "Dreaming Of Me", back in 1981. Like a handful of their singles, it was sung by Martin Gore instead of Dave Gahan and was followed by the similarly titled, but much more upbeat, "A Question Of Time". Both were taken from the Black Celebration album but it would be a few more years before Depeche Mode would enjoy a mainstream hit again. There are few acts more mainstream than the man at number 28: "Glory Of Love" by Peter Cetera. The former Chicago singer with the unmistakable voice had a number 9 hit in Australia with this soft rock power ballad from the Karate Kid II soundtrack. A song that would go on to be a popular love song dedication for decades, "Glory Of Love" has everything a good movie song should have: a rousing chorus, a dramatic middle eight and a key change at the end. Brilliant. A song that's often over-looked is at number 27 - it's "Heartache All Over The World" by Elton John, which actually performed quite well on the Australian chart, reaching number 7. But ask most people to hum a few bars of it and they'd be stuck. Quite why so much of Elton's '80s output has been swept into the dustbin of pop is beyond me since he released a string of incredibly catchy songs - even if he doesn't remember much of the era anymore. Another long-forgotten single by an artist better known for other tracks is at number 26: "I've Been Losing You" by a-ha. The first release from the Norwegian trio's second album, Scoundrel Days, it was another classic pop song and reached number 21 in Australia (their biggest hit behind "Take On Me" and "The Sun Always Shines On TV") - but has faded into obscurity now. Better to have so many hits that some get forgotten than to only have one, which brings us to number 25: "My Favourite Waste Of Time" by Owen Paul. The Scottish singer reached number 3 in the UK (number 23 in Australia) with this sing-along pop classic - itself a cover version - and that was that. Another one-hit wonder (at least, in Australia) is at number 24 - it's "We Don't Have To Take Our Clothes Off" by Jermaine Stewart. Although, with a peak position of number 37, it was barely even that here. In the UK, the song, which was recently reinterpreted by Gym Class Heroes, was a huge number 2 hit - and although Jermaine also had success there with "Get Lucky" and "Say It Again", he'll always be best remembered for "We Don't Have To...". After two one-hit wonders, here's a two-hit wonder at number 23: "Two Of Hearts" by Stacey Q. In fact, both this and follow-up "We Connect" reached number 7 in Australia -although "Two Of Hearts" spent 10 weeks longer on the top 100. Born Stacey Swain, the Q came from the name of a synthpop group Stacey had previously provided vocals for. At number 22: "Stand Up" by Hazell Dean, which was another in a string of unsuccessful singles between 1984 and 1988 for the Stock Aitken Waterman-produced recording artist. In the early days of the internet, I tracked down a 12" copy of this song online and paid handsomely for it. Well, when I said "paid", I actually traded other records and CDs for it - and since this was quite a rare release I had to send about 3 or 4 items just to get this one record back. More recently, the track (in both 7" and 12" form) was included on a re-release of Hazell's Always album. And onto a band who had been big at home and finally had a hit abroad - at number 21 it's "Funky Town" by Pseudo Echo, the chart-topping (for seven weeks) cover of the 1980 Lipps Inc. chart-topper (for two weeks). This keytar-tastic version of "Funky Town" would crack the UK (number 8) and US (number 6) top 10, but the good times were short-lived, with it proving to be the Melbourne band's last substantial hit. In Part 3, I'll continue my trip through my favourite songs from 1986. Before that, this Thursday's regular look back at the ARIA chart from 25 years ago.